Kaplan, Robert B., & Baldauf, Richard B. 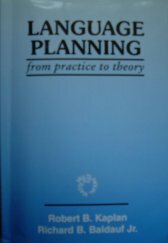 (1997): Language planning from practice to theory. 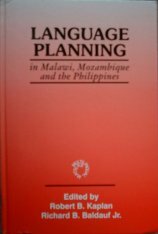 Clevedon: Multilingual Matters Ltd. 403 p.
(1999): Language planning in Malawi, Mozambique and the Philippines. 171 pp. (2000): Language Planning in Nepal, Taiwan and Sweden. 总的说来，本书综合了各家之言，提出了一种基于生态概念之上的语言规划理论。较之以前的理论而言，它具有更好的适应性和解释力。但是我们也应该看到，本质上本书强调的仍然是语言规划的社会(语言)学特征。对于语言学方面的问题，其讨论仍然是过于简单。例如，作者在论述语言规划作为一门独立学科的必要性时，引述了Tauli(1984)一文的观点。但是事实上，Tauli 的文章所倡导的是要重视从语言评价到语型规划的语言规划理论，并且对于常见的那些只注重社会方面的规划理论给予了毫不留情的批评, 他说：“But more important than sociology is teleology. ... The goal of LP should be to make the language as efficient a means as possible. ... We should try to make the language more suitable to modern culture and society.”(1984: 89)。Tauli 关于语言规划的详细理论见其 1968 的专著。就我个人而言，我比较偏爱Tauli的语言规划理论，因为既然语言规划也是一种‘规划’活动，那么它的一般目标应该与其他规划领域相似，即：对于规划对象的优化。当然如果本书能够真正结合Tauli 的理论，那就完美了。我曾经在另一篇文章(1999)中简要提到为什么语言规划界忽略 Tauli 的原由，现在看来语言规划领域中过于重视“地位规划”的风气难以改变，就是在这本书的参考文献里，我们也没有发现 Tauli(1968)! Liu, Haitao. (1999): "Kiel evoluas interlingvistiko? Kompara Studo." In: Language Problems and Language Planning 23(1), 65-77. Tauli, Valter (1984): "The failure of language planning research." In: Gonzalez, Andrew FSC (Red. ): Panagani: Essays in honor of bonifacio P. Sibayan on his sixty-seventh birthday. Manila: Linguistic Society of the Philippines, 85-92. Tauli, Valter (1968): Introduction to a theory of language planning. Uppsala: Almqvist & Wiksell.